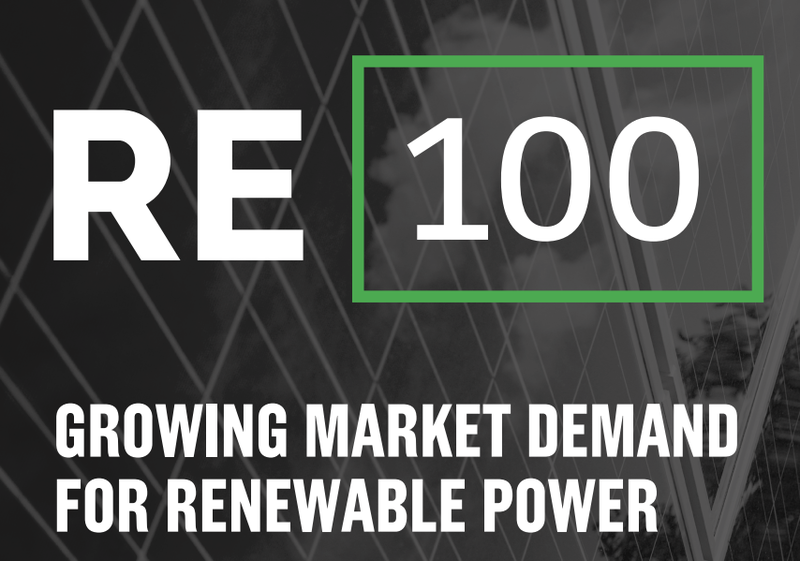 RE100 is a collaborative, global initiative of influential businesses committed to 100% renewable electricity, working to massively increase demand for - and delivery of - renewable energy. The RE100 initiative is working to increase the sourcing of renewable electricity by companies as the private sector accounts for approximately half of the world’s electricity consumption. Companies committed to the initiative are encouraged to set a public goal to procure 100 percent of their electricity from renewable sources by a certain year. Switching the demand to renewable electricity will accelerate investments in renewable energy and aid the transition towards a low carbon economy. The RE100 initiative is partnered with the carbon disclosure project (CDP), and is engaging with some of the biggest and globally most recognized companies from a wide range of sectors. There are a number of benefits to set a goal of 100 percent renewable sourcing. Sourcing renewable electricity will, for example, reduce the carbon emissions of a company, which will have a direct impact on the carbon footprint of an organization. Procurement of renewable electricity sourced from generators and suppliers in the market: This can take the form of green electricity contracts with utilities, Power Purchase Agreements (PPAs) or sourcing renewable electricity certificates from a trusted source such as Track my Electricity. The latest 2017 annual report for RE100 revealed that renewable energy certificate purchases were the most popular approach for reaching renewable targets among the companies participating in the initiative. It accounted for over 60% of renewable electricity consumed by these companies globally, and was by far the most popular option in the US. Production of renewable electricity from their own on-site and off-site facilities: A company may produce its own renewable electricity from installations it owns or controls. These can be grid-connected or entirely off the grid. RE100 encourages companies to be completely transparent about the options they have chosen to meet their renewable electricity goals. Track my Electricity helps companies across the globe to meet their renewable energy goals in compliance with RE100 criteria and also provides an advanced communication package to enable full disclosure about your energy source in transparent and credible manner.